Home Uncategories Spratlys: The History, UNCLOS, & Archipelagic - Says "The Philippines territory"
Spratlys: The History, UNCLOS, & Archipelagic - Says "The Philippines territory"
The Sultanate State of Sulu is the legal owner of the Spratlys Archipelago but since the Sultan Kiram turnover his territorial and proprietary rights of the State to the Republic of the Philippines including the North Borneo, Palawan and the Spratlys in 1960’s, then legally it belongs to the Philippines. Under the UN International Laws of Sea, despite the opposition of maritime powers, the Philippines and four other states (Indonesia, Papua New Guinea, Fiji and Bahamas) got the approval in the UN Convention on the Law of the Sea held in Jamaica last December 10, 1982. They were qualified as archipelagic states. The Spratlys is within Philippines proximity and connected in the Philippines’ archipelago with just few kilometers from the province of Palawan of the Philippines, this boost the claim of the Philippines. Other claimants are not archipelagic states and they are far from beyond the limit of the UNCLOS of 200 nautical Miles Exclusive Economic Zone. The Philippines as an archipelagic country & within proximity, it counts merit in administering the Spratlys. China argued that there is no word proximity mentioned in the UNCLOS so they insisted that they could claim the Spratlys. Though there is no “proximity” mentioned, the UNCLOS clearly explain the 200 Nautical Miles Exclusive Economic Zone (EEZ) which is more clear explanation than proximity. Proximity is just to say near but the measurement of 200 Nautical Miles from the base line of the Philippines is not just synonym to proximity but a clear measurement of distance. Under the UNCLOS, it guarantees 200 Nautical Miles Exclusive economic Zone which most part of the Spratlys is just within 200 Nautical Miles Exclusive Economic Zone of the Philippines. 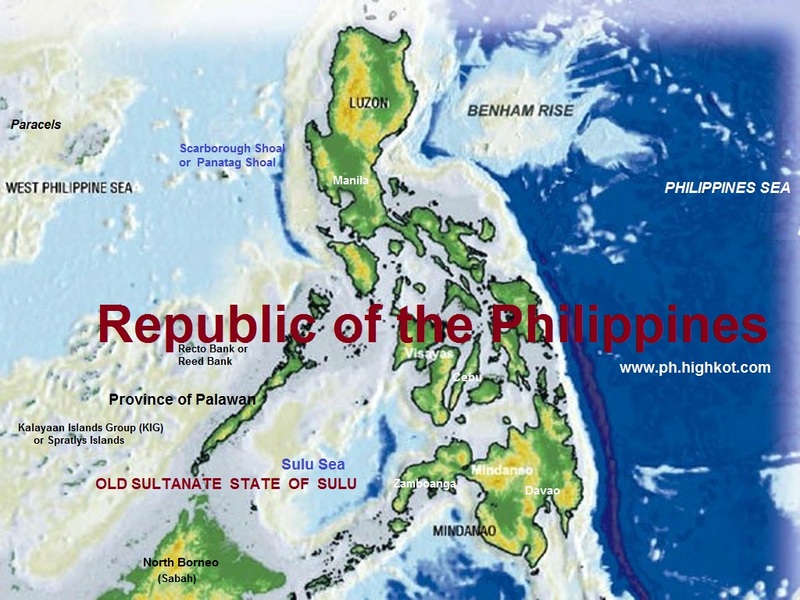 This is the strongest bases of the Philippines to say “We owned the West Philippines Sea”. Even China is a signatory in these and they even agree with this together with the United Nations. Back to Majapahit and Sri Vijaya Empire in year 7000 or 7th century (The ancient kingdom in Indonesia and Malay Archipelago) the territory is extended from the North Borneo, Palawan, and the Spratlys of the Philippines' territory. The Sultanate State of Sulu was established during that regime which area includes Part of Mindanao (Cotabato, Lanao, Zamboanga Peninsula), Basilan, Sulu Sea, and Sulu. During the 14 century or year 1400 the King /Sultan of Brunei give as gift to his cousin Sultan of Sultanate of Sulu the “North Borneo, Palawan and the Spratlys” for helping him to win a battle. The China recognized the Sultanate State of Sulu that includes the North Borneo, Palawan and the Spratlys archipelago. When the Spain invaded the Philippines in year 1621, the sultanate state of Sulu remains un-conquered but portion of the territory was controlled by Spain including the whole Island of Mindanao, and Palawan. When the Britain gives independence to Malaysia, North Borneo is under a lease agreement which is until now is recognized by Malaysia was illegally included reason why the Sultan of Sulu calling the Malaysian Governmet to stop controlling his land “North Borneo” (Sabah) which is also link to Spratlys. The Sultan of Sulu turnover his territorial and proprietary rights of the State to the Republic of the Philippines including the Palawan and the Spratlys in 1960’s. The History, the UNCLOS International law of Sea, the archipelagic states theory says “The Spratlys is belonged to the Philippines. At the moment they are administered by the Philippines, but some are claimed by Brunei, Taiwan, China, Vietnam, Malaysia and Indonesia. They comprise less than five square kilometers of land area, spread over more than 400,000 square kilometers of sea. The Spratlys, as they are called, are part of the three archipelagos of the South China Sea, comprising more than 30,000 islands and reefs and which so complicates geography, governance and economics in that region of Southeast Asia. Such small and remote islands have little economic value in themselves, but are important in establishing international boundaries. There are no native islanders but there are rich fishing grounds and initial surveys indicate the islands may contain significant oil and gas. About 45 islands are occupied by relatively small numbers of military forces from the People's Republic of China, the Republic of China (Taiwan), Malaysia, the Philippines, and Vietnam. Brunei has claimed an *EEZ* in the southeastern part of the Spratlys. *Exclusive Economic Zone, under the law of the sea, an EEZ is a sea zone over which a state has special rights over the exploration and use of marine resources. In various conferences of the United Nations on the Law of the Sea, the Philippines and other archipelago states proposed that an archipelagic state composed of groups of islands forming a state is a single unit, with the islands and the waters within the baselines as internal waters. By this concept (archipelagic doctrine), an archipelago shall be regarded as a single unit, so that the waters around, between, and connecting the islands of the archipelago, irrespective of their breadth and dimensions, form part of the internal waters of the state, subject to its exclusive sovereignty. "The waters around, between and connecting the islands of the archipelago, regardless of their dimensions, form part of the internal waters of the Philippines." On the strength of these assertions, the Philippines Archipelago is considered as one integrated unit instead of being divided into more than seven thousand islands. The outermost of our archipelago are connected with straight baselines and all waters inside the baselines are considered as internal waters. This makes the large bodies of waters connecting the islands of the archipelago like Mindanao Sea, Sulo Sea and the Sibuyan Sea part of the Philippines as its internal waters, similar to the rivers and lakes found within the islands themselves. c) respect for passage through archipelagic sea lanes subject to the promulgation by local authorities of pertinent rules and regulations. When the Britain gives independence to Malaysia, North Borneo is under a lease agreement which is until now is recognized by Malaysia was illegally included reason why the Sultan of Sulu calling the Malaysian Government to stop controlling his land “North Borneo” (Sabah) which is also link to Spratlys. Spratlys Islands or Kalayaan Island Group is just within the Philippines' proximity and 200 Nautical Miles Exclusive Economic Zone - under the International Laws Sea - UNCLOS. The Philippines as the closest and archipelagic country of the Spratly island with another Five Asian countries claim the Spratly Islands including - China, Taiwan, Vietnam, Malaysia and Brunei. Disputes among these six parties have led to various minor military skirmishes, the detention of fisherfolk and diplomatic rows in the past three decades. Control of the Spratlys is important since the region is supposed to contain large deposits of oil, gas, hydrocarbon and mineral resources. The islands are also strategically located in the sea lanes for commerce and transport in the South China Sea which is very close to the Palawan Province of the Philippines with a distant less than 200 nautical miles; a bases that Philippines has a legal ground that those islands are part of the Philippines. The Spratlys consist of about 26 islands and islets and 7 groups of rocks in the South China Sea found approximately between the latitude of 4 degrees to 11 degrees 30'N. and longitude 109 degrees 30'E. They have a maritime area of 160,000 square kilometers and an insular area of about 170 hectares. The Spratlys are popular among fishermen. However, they are considered dangerous for commercial navigation. Maps from the early part of the last century have advised seamen to avoid passing through them. Japan explored the Spratlys for military reasons during World War II. The British Admiralty and U.S. Navy have also ordered some top secret missions there. But the U.S. Navy never released the new charts of the Spratlys to civilian authorities. Writer Francois-Xavier Bonnet wonders about the role of the Spratlys during the Vietnam War. In 1933 a Philippine senator protested the French annexation of the Spratlys. A parliamentary committee studied the issue but the U.S. government, which controlled the Philippines at that time, did not take an interest in the matter. In 1946 Vice President Elpidio Quirino claimed the Spratlys on behalf of the Philippine government. A year later, the Philippine Secretary of Foreign Affairs declared that the "New Southern Islands" previously occupied by Japan during World War II were part of Philippine territory. In 1955 the Philippine military reported that the Spratly island group was of "vital proximity" to the country. The following year, Filipino navigator and businessman Tomas Cloma issued a "proclamation to the whole world" claiming ownership and occupation of the Spratlys. Cloma sent six letters to the government about the need to settle the question of ownership of the islands. The vice president of the Philippines replied in 1957, assuring Cloma that the government "does not regard with indifference the economic exploitation and settlement of these uninhabited and unoccupied islands by Philippine nationals." According to Filipino law professor Haydee Yorac, the Cloma Proclamation was the first assertion of title to the Spratlys after Japan renounced its ownership of the islands in 1951 and 1952. In 1978 President Ferdinand Marcos issued a proclamation declaring ownership of most of the islands in the Spratlys. The area was renamed the Kalayaan (Freedom) Island Group. The proclamation laid the following basis for the Philippine claim: "By virtue of their proximity and as part of the continental margin of the Philippine archipelago"; that "they do not legally belong to any state or nation, but by reason of history; indispensable need, and effective occupation and control established in accordance with international law"; and while other states have laid claims to some of these areas, their claims have lapsed by abandonment and cannot prevail over that of the Philippines on legal, historical, and equitable ground." In 1995 President Fidel Ramos articulated the Philippine position regarding the Spratlys issue. He said "I would like to clarify that the Philippines does not only claim eight islands in the south China Sea but owns all islands and waters in the Spratlys as defined in the presidential decree issued by former President Marcos." Militarization of the Spratlys started in the 1970s. The Philippines sent a military contingent to occupy some of the islands in 1971. After four years, the Philippines had already established a military presence in six islands. Today, the Philippines occupies eight islands in the area.